The pulp and paper industry has been under severe scrutiny from various groups over the past twenty five years and must be extremely cost conscious to survive. A combination of strict environmental regulations and increased world competition have made it so only the most efficient mills survive. Reliability, reduced energy requirements, and cost effective repairs can make the difference between success and failure. The Sulzer LRS multi-stage liquor pump is an extremely critical pump in the pulp mill process. The LRS is a very complicated unit to repair and if done improperly can idle mill production. High reliability and long “Mean Time Between Failure” (MTBF) is obtained by controlling all factors in regards to the Sulzer LRS pump repair. 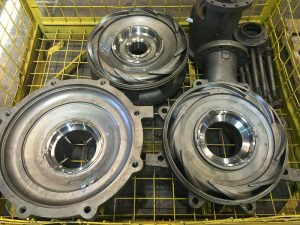 After disassembly we thoroughly evaluate all of the pump components to identify any abnormal wear patterns or severely worn parts that can be upgraded to increase the life of the unit. Our decades of experience and long-term co-operation with the end-users, material suppliers, bearing manufacturers and sealing solution providers make Schur & Company the leader in this sophisticated repair. Schur and Company can also offer loaner service exchange units. Many mills have multiple Sulzer 2 LRS-15 pumps in service, but only have one spare unit. 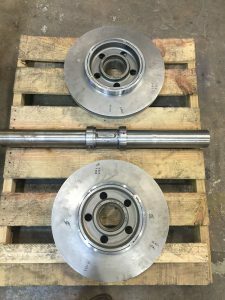 We can either offer a direct service exchange where there is no waiting on a repair, or offer to deliver a loaner pump to keep at the mill as a stand by while we repair your unit.